HCL hiring fresher graduates and postgraduates through HCL Off Campus Drive 2018. In order to beat the vast competition aspirants must have a grip over the topics of Aptitude, Reasoning, English and Technical related core subjects. HCL is an Indian Multi National Company. It provides services like Enterprise transformation, Software consulting, BPO etc. 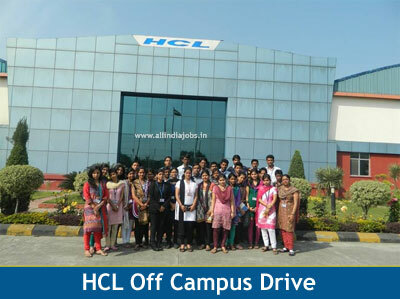 Due to heavy competition, HCL is going to conduct off-campus drives in various places such as Visakhapatnam, Hyderabad, Chennai, Bangalore, Kolkata, Mumbai, Pune, Noida, Gurgaon, Ahmedabad, Cochin and many other cities. Before applying for HCL off campus drive you need must check details like a registration form, interview process, eligibility criteria, educational qualification etc. Contenders are suggested to check all the details before going to apply for job openings. In this post, we discussed HCL latest job openings in India. Nowadays companies are seeking for highly motivated engineering graduates and postgraduates willing to participate in the development of next-generation technologies. Just like previous years, this year also HCL is going to recruit a vast number of freshers through college off campus drives. Every fresher candidate dream is to get a job in HCL. For the sake of candidates, we are furnishing HCL Placement Papers and HCL Interview Questions. Practice hard until you get success. Keep on visiting our site All India Jobs for latest job updates. Bachelor’s Degree – BE, B.Tech (ECE, CSE, IT, Civil, Mechanical, EEE), BBA, Any Graduate and Post Graduates. Aspirants who had completed full-time course only those people are eligible. MCA with BSc / BCA / BCom / BA (with Math / Statistics Background). M.Sc in Computer Science / Information Technology. Highly proficient in any of these i.e. C, OS, Networking, Programming, MS Office Excel, Word, Outlook. Knowledge of instruments like Equities, Bonds, Derivatives, FX, Bank Debts, etc. Should have good knowledge of Accounting, Mutual fund industry, Capital Markets, servicing of institutional assets (funds) and various intermediaries. Willing to sign a service agreement of 24 Months. Willing to relocate anywhere in India. Willing to work in 24*7 environment. At present, the IT industry prefers minimum 60% aggregate in all academic records. So that candidates who are interested to apply for HCL Off Campus drive they have to set their all mandatory certificates in a proper manner. During certificate, verification aspirants have to show originals documents. Aspirants who are having backlogs they are not eligible to apply for HCL Off Campus drive. It is mandatory to each and every candidate to clear backlogs at the time of appearing for HCL Off Campus Selection Process. Based on performance in the selection rounds the shortlisted candidates will appear for the next rounds. JAM or GD or General Essay. Versant Test or Typing & Aptitude Test. The issue of the Offer Letter. HCL will provide salary based on their performance shown during the Interview Process. As per the sources HCL will provide the finest pay according to their role which was offered in the market to the selected candidates. In the below section we have provided registration link. Click on Apply Here link. Read the entire application form clearly. Then Submit the application form. Take a print out of it and note your Reference ID and Password. Carry Hard copies of Updated Resume. Bring ID proof issued by the government (PAN Card, Aadhar Card, Passport etc..,). In addition to this HCL Off Campus Drive, we are advising some useful suggestions to crack HCL Off Campus Drive. With the help of these tips, aspirants can easily get their dream job. Contenders must have good communication verbal and written skills. Willing to work in any shifts. Knowledge on your core subjects is very important. Practice HCL Placement Papers and Syllabus. Must refer basics of your technical subjects. Have a look on HCL Test Pattern and refer it before going to interview. We hope the context about HCL Off Campus is useful for the job hunters. If your profile is matching with this openings can apply for the latest vacancies in HCL through online mode by the above provided registration link. Practice hard to get a job in HCL company. Keep on checking our site www.allindiajobs.in for current updates. I AM SEARCHING A JOB IN BACKEND IN NOIDA. I HAVE COMPLETE MY B.TECH (COMPUTER SCIENCE).